Michelle Hart, co-owner of the Maximus Salon, had to raise her voice over the roar of heavy machinery to answer questions last May about Hermosa’s ongoing makeover of upper Pier Avenue, the iconic main drag that runs past her door. “There is no foot traffic. Walk-ins are down 75 percent – just gone, disappeared. They are just putting people out of business and this is not what they were promising,” she said at the time. Outside her doors, workers were ripping up the roadway, widening the sidewalks from 10 to 14 feet, creating expansive new pedestrian spaces, laying down an environmentally friendly storm drain system and installing a palm-lined median, in the most transformative municipal improvement project since lower Pier Avenue was turned into a pedestrian plaza in 1996. Hart lamented that the avenue’s merchants and restaurateurs would lose vital summer business as tourists and locals face road closures, detours, dust, noise and parking challenges even greater than the usual. 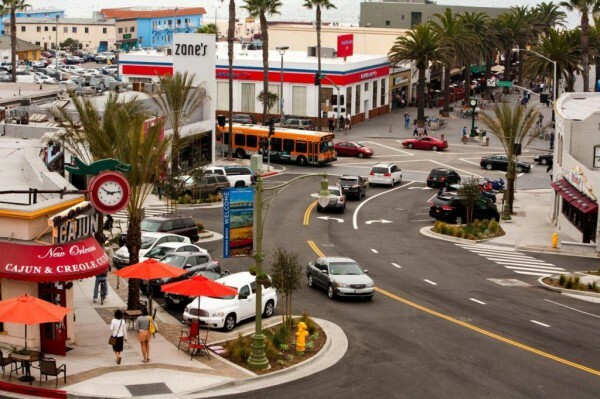 The avenue that runs downhill from Pacific Coast Highway toward the ocean sparkles new and spacious, with pedestrians strolling its sidewalks and long-vacant properties serendipitously coming to life on both sides of the roadway. Businesspeople say their patrons are still finding their way back to the avenue, but the numbers of returnees is continuing to build. Ed Hart, Michelle’s husband and the other co-owner of Maximus, spoke highly of the results of the avenue’s nine-month overhaul. “I have to say we didn’t like the delivery, but we like the baby. The delivery was painful, but the baby is cute,” he said. Last week City Councilman Kit Bobko, who led the charge for the nine-month, $4.3 million overhaul, expressed satisfaction over the finished product. Bobko said he’s heard expansive compliments from movers and shakers in Manhattan Beach, an upscale neighbor that is at once loved, resented, envied and pitied by emotionally conflicted Hermosans. “I’ve heard from the city to the north, ‘You have the prettiest little beach town now,’” Bobko said. However, a significant complaint, voiced by some merchants and at least one member of a city committee that helped prepare for the makeover, is that too many professional offices dot an avenue that was designed as a pedestrian shopping district. And a leading light in a 31-year-old law office, the first to undergo an extensive remodel on the remade avenue, said he and his partners felt unwanted when the city held them to design standards more suitable for a store or restaurant. The avenue’s sparkle is being bolstered by the appearance of some new businesses and some newly revitalized ones. High-powered real estate broker Raju Chhabria has torn down the venerable Alta Dena drive-up dairy building, which stood vacant at the avenue’s Manhattan Avenue intersection for about three years following its closure. Chhabria will build a 6,000 square-foot, three-story building with a snack shop or coffee shop on the ground floor and professional offices above, including his own on the top floor, overlooking the blue Pacific. Chhabria said the lending environment is so tight that he has to use his own money to build the project, which totals about $4 million, counting the purchase of the land. But he doesn’t lose sleeping over how he will fill the building. He said he knows Realtors paying $5 a square foot for leased offices in the 200 Pier complex across the avenue, and if he gets that price his project would work out. “I’m not too worried,” he said. The project has drawn interest from three or four coffee shop applicants, and Chhabria said he’s heard interest in the avenue from numerous restaurateurs. “Hermosa is looking really nice,” he said. The 200 Pier project across the avenue from Chhabria’s is a 53-unit complex of condo-style offices that tiers up three stories from a corner property with a commanding view of the ocean. In September, a partnership including Hermosan Dave Mercer bought the nearly empty, but good-as-new complex, and have since signed lease deals with more than 20 tenants. The street level is lined with professional offices and cozy, individualistic boutiques, including the Oliovera olive oil shop, the Aera Home store offering unique and affordable sculpture, painting and other artworks, and Anthology with its handbags, clothes, jewelry and paintings. The merchants didn’t have to brave the Pier Avenue reconstruction, but they are reaping its benefits. “The timing was perfect,” Mercer said. The complex was built to replace an aging, monolithic office building once owned by ski movie pioneer Warren Miller, and then failed under its first owners, who were trying to sell the office condos as the economic recession struck. Mercer’s group wound up buying the complex from the original owners’ lender. Just up the avenue, a large, two-building development straddling Loma Drive had also been hammered by the recession. Al Marco had planned a mixed use of stores on the ground floors, offices above, and a restaurant, or maybe a snack shop or coffee shop, to replace the old White & Day Mortuary, which moved out back in 2004. But the economy went sour, and tenants were not found for the mixed-use project. “We had some initial retail interest, however, as the economy worsened the retail sector was the hardest hit. Many retailers jumped out of the market altogether. It was not a question of price because the [prospective] tenants just stopped coming,” wrote marketing agent Colliers International in a letter to city planning officials. Then, as 2011 dawned, a new buyer, El Segundo-based investment firm Marlin Equity Partners announced its intention to occupy the entire development. At the urging of city officials, Marlin Equity plans to add an atrium visible from Pier Avenue, along with other touches to relieve the somewhat imposing facades of the buildings. Marlin Equity has said that its daytime use of the offices will increase trade to other area businesses during daylight hours, a goal long held by City Council members. A sticking point in the era of good feeling on the avenue is the prevalence of offices, spas and salons, which are seen by critics as impediments to window shopping. “They’re slowly edging out any shopping areas,” said locksmith Frank Hallstein Jr., whose shop stands across the avenue from City Hall. Jerry Gross, a member of the city-appointed Upper Pier Avenue Committee, which studied the makeover for a year before it was launched, lamented similarly as he strolled the avenue last week, pointing out law and insurance offices, and salons for humans and dogs. He said people won’t stroll and window-shop portions of the avenue occupied by “destination” businesses. “There is nothing spontaneous on this whole stretch,” he said, looking over salon row. The study committee hoped to wind up with destination businesses in the upstairs portions of buildings and stores downstairs, with their window displays at pedestrian browsing level. Bobko agreed with that goal, but said the market should dictate how buildings are used, with only a light hand of government for guidance. He pointed to the Marlin Equity building, saying it replaces a vacant spot that was of no use to the city or its neighbors, and defaulted to office use after mixed use fell through. “The new occupants will pay taxes, buy lunches for clients, take their spouses to dinner – the market is operating as the market operates,” Bobko said. Still, Bobko nodded to a mixed-use priority in the specific area plan the city adopted for the avenue, and said the mix of offices on top and retail below should be encouraged. Gross expressed disappointment that the 31-year-old law office of Baker, Burton & Lundy is set to expand into a next-door building with a common wall, last occupied by the eatery Jackson’s Bistro. Gross stressed that the firm is acting within its rights and is “not doing anything wrong,” but he hoped that that the firm’s work could have found its way upstairs, with retail spaces below. Albro Lundy, a partner in the law firm – a quietly high-powered one that has won billions of dollars for consumers in energy industry settlements – said he did not understand why the city required a 70 percent plate-glass front for the new, bigger building. The requirement might dovetail with the preferences of retailers, but runs counter to the needs of a law office, he said. The partners tried to get approval for an extension of thick, block glass like the kind that has long graced the front of their existing office building, but could not get the nod. “They are trying to encourage retail. ‘Encourage’ is a gentle word,” Lundy said. Nobody told the partners their type of business was not desired on the avenue, but “It goes without saying, you’re not going to get a law firm to move in here, knowing they have to have 70 percent glass,” Lundy said. He and his partners dealt with the plate glass requirement by going on “a major league search” for a glass treatment that would look appropriate and afford some privacy. They wound up with a design featuring slump glass – which is poured molten into a mold – in the shape of a wave. The wave will start on the first of three large panes, break on the middle one, and diffuse into whitewater on the third one. A second pane behind each decorative pane will help minimize noise from the avenue. The block glass will go by the wayside, along with a portico and columns that have stood at the entrance of the existing Baker, Burton & Lundy office. Lundy said the design requirements made the partners feel unwanted after three decades on the avenue, and they looked at two possible alternative locations in Redondo Beach. The law partners could have made their case for a plate-glass exemption before the city Planning Commission, but they did not believe it would be granted to the first business to remodel under the new avenue guidelines. “Unfortunately, we were the guinea pigs,” Lundy said. He said the slump-glass building front will be attractive. The firm’s expansion comes as it takes on two new attorneys. Before Pier Avenue was remade last year, the roadway itself was in disrepair, and its funky slope caused heavy rains to overwhelm storm drains and gutters, and flood a handful of businesses near the downhill, western end. City officials looked beyond the needed repairs to an overhaul aimed at creating a calmer, more pedestrian-friendly avenue. Just such an overhaul was suggested in 1992 by an urban design team from the American Institute of Architects, the same folks who urged Hermosa to create the Pier Plaza at Pier Avenue’s seaside terminus. City officials funded the reconstruction with $4.3 million in OPM — Other People’s Money – in this case from the federal, state and county governments. The reconstruction was launched last January, and like many large public projects, construction went on longer than officials hoped. The initial target for completion was mid-July. In May, that was moved to mid-August. The ribbon cutting marking completion finally took place in October. A pivotal moment in the project came in the planning stages, when the public roundly rejected the notion of reducing the avenue’s four lanes to two. Workers laid down temporary striping to let residents see what it would be like to have a narrower avenue and sidewalks even wider than the ones they wound up with. Emails flooded City Hall and residents trooped to public meetings to complain of backed up traffic and slowed down car trips, and the lane reduction idea was scuttled. Before the notion was nixed, however, J.R. Reviczky, then a city councilman, drove the length of the avenue repeatedly at rush hours, timing the trips with a stopwatch, and concluded that the trips did not take as long as many motorists imagined. 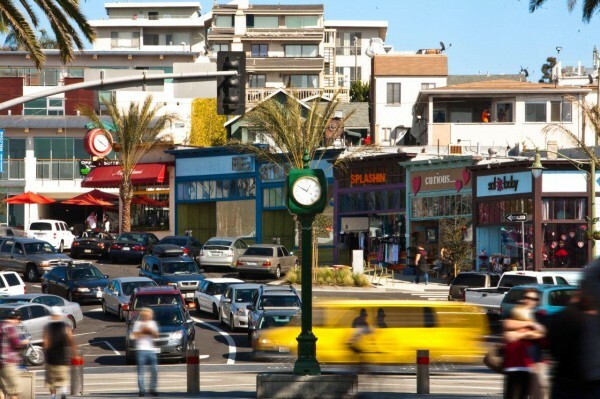 During the planning period, Bobko said, he had become convinced by UPAC member Dean Nota, a renowned Hermosa Beach architect, that reducing the traffic lanes and pushing the sidewalks even wider would best produce a pedestrian paradise. Bobko last week said the reduced lanes would have worked out best, but the public reaction to the striping experiment left the City Council with no choice but to reject it. Two months ago a Pier Avenue eatery found itself in the middle of a City Council debate over alcohol and its effects on the tranquility of residential neighborhoods that stand check to jowl with restaurants. At the council’s last regular meeting of 2010, representatives of Buona Vita restaurant offered to close an hour earlier, at 10 p.m., if officials would change a conditional use permit to allow them to upgrade a beer and wine license to include spirits as well. Bobko has insisted that restaurants with 10 p.m. closing times do not cause problems for police or residential neighbors, and he was joined by Councilman Michael DiVirgilio in backing the owners of the eatery, a 20-year mainstay on the avenue. DiVirgilio said such trade-offs with restaurants are needed to keep downtown rowdiness from returning to 2006-2007 levels, once the economy improves and larger crowds return to the area for the nightlife. Mayor Peter Tucker and Councilman Jeff Duclos pointed out that the city’s Planning Commission had unanimously rejected Buona Vita’s plan, and Tucker said while any change to the eatery’s conditional use permit could be undone in time, an expanded liquor license would continue to be in effect for the current owner and future owners. Councilman Howard Fishman, the swing vote, praised the “innovate plan” to trade restaurant concessions for full alcohol service. But he declined to support it, saying that without a clear council policy on such trade-offs, a window would be opened for expanded alcohol service at restaurants on an ad-hoc basis. Before the council discussion, seven residents said they did not want Pier Plaza-style alcohol service creeping up to upper Pier. Full liquor at Buona Vita was endorsed by two others, including a longtime Buona Vita worker. In addition, about 120 people signed a petition backing the eatery. A few blocks north of Pier Avenue, on the corner of Hermosa Avenue and 14th Street, Bacio Café is trying to add beer and wine to its food menu, and the owners say they have no intention of staying open past 10 p.m. But a neighbor has complained to state alcohol regulators, and the restaurant’s plan has stalled. Co-owner Michelle Faraj said patrons expect the option of wine or beer with dinner, and she holds out scant hope for a good dinner crowd without the beverages. Faraj said the café owners have not been able to persuade the staff of the state Alcoholic Beverage Control to support their position at a possible hearing, because of the nearness of the objecting neighbor. She said she also has not been able to persuade the neighbor that her restaurant would not cause problems. If the café is unsuccessful at a hearing, it would have to wait a year before reapplying for a license to serve beer and wine. “One person is holding back a business that employs half a dozen people,” she said. The neighbor declined to comment. A few doors down 14th Street, the Mexican restaurant La Playita quietly serves beer, wine and spirits without drawing any attention from neighbors or law enforcement. Owner Harold Cohen says that’s because La Playita closes at 9 p.m.
“It’s all related to the fact that we close up early,” he said, stressing that he was not speaking to the issues of other restaurants, but was simply relating his own experience. Back on Pier Avenue, the owners of two businesses that stand catty corner to each other are being rewarded for their faith in the big makeover, despite the pain of the nine-month construction slog. Lori Ford, co-owner of the Gum Tree café and boutique, said she and her husband opened their doors knowing the construction project would soon take place. Customers stayed away in droves, and all but abandoned the patio dining area, but now business is up 40 percent from its low point last year, and the sun-splashed patio is busy. And the makeover resulted in a new tradition, First Thursdays, in which downtown shops stay open late while merchants and restaurateurs offer discounts, free munchies and live entertainment on the initial Thursday of every month. Ford, not content to sit around and watch her revenues dwindle during the road construction, spearheaded the creation of First Thursdays as a way to stem the customer exodus from the area. The event was launched in May 2010 and now boasts participation by 40 to 50 downtown area businesses, mostly on Pier and Hermosa avenues and the Pier Plaza. Across the avenue, Rick Hankus of the venerable Java Man coffeehouse, located in an old house that was built in 1929, tells a similar tale of construction woes followed by rebounding revenues. “I’d say it was down about 30 percent. It was definitely bad. They broke ground right in front of my business. I knew it would take a long time, construction is always that way. I just didn’t realize how long it would be,” he said. There was no peace to be found at Hankus’ outdoor tables, and even the customers who were indoors closed up their laptop computers and hit the road. “The city was really good, they kept me informed of what they were doing, and the contractor was great,” Hankus said. The contractor agreed to delay the start of work outside the Java Man doors from 9 a.m. to 10 a.m., to give the morning business a break. “It was just a long project,” Hankus said. Hankus said his business was continuing to bounce back, although rainy weather following the construction appeared to slow the process. Bobko said the avenue’s transformation is not complete. He hopes the mixed-use, two-story concept will catch hold more firmly, and he spoke of encouraging more outdoor dining on the avenue, although the city’s study committee did not support that goal. “I would like to see more of an outdoor culture develop on the street. I have not been able to garner support for this on the council, but I think dining adds ambience on the street, and creates more of a desire to get out and walk,” he said.